congrats! i am sure you feel great reading it. Hey Anu, being called multi-talented, yeah, sure, but super-sophisticated? With "delicious opinions" on everything? Woooohooooo! Makes me want to go through this experience - through 'magic' eyes! This is just awesome!! Congrats and great going!!! Congrats. I started reading your blog since last year. I love reading your blog. I love all small details you write about the city especially I love reading your mom's post office visit. Living in US makes me miss those times . 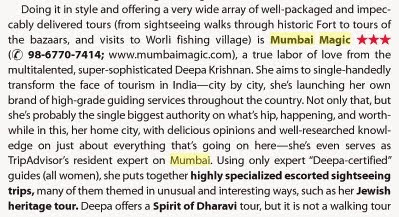 When everybody wants to visit europe and other exquisite places , Bombay is on my list. And it was on my list for a long time ever since I was a little girl. I really wished I had known this website before 2007 when I had all the time in the world. I will defnitely contact you when I get a chance in future to visit bombay. Hearty congrats.. Though I haven't taken the tour myself, I can say with 100% assurance that not a single word in this review is hyped! God Bless You and your awesome team!!! I think that you could manage a Deepa-fied super-sophisticated swirl (am imagining a suitable outfit to work well here!) Well deserved – I'm a fan from way back!